Dr. Gary Simms is a renowned and respected restorative dentistry specialist in Decatur Georgia, serving DeKalb County. He cares about his patients’ convenience, comfort, and safety, which is why he always keeps their best interests in mind when developing and recommending treatment plans. His commitment to patient satisfaction is made evident by his outstanding chair-side manner, his surgical and procedural precision, and his attention to even the most minute details. Metro Decatur Dental Group PC in Decatur offers multiple restorative dentistry procedures, all of which focus on restoring the integrity of your smile and improving the health of your teeth and gums. Together, we can preserve your oral health and make your radiant smile last a lifetime. Dental crowns, offered at our restorative dentistry practice in Decatur, are porcelain caps that engulf structurally flawed tooth to mask imperfections and preserve the tooth’s structure. Crowns can also be used in conjunction with a dental implant to replace a single, missing tooth. The natural-looking restoration is hand crafted to blend in seamlessly with the rest of your existing teeth. While dental crowns address a single missing tooth, dental bridges bridge the gap created by multiple missing teeth. Both types of porcelain prosthetics are hand-milled by experienced laboratory technicians for additional precision and perfection. We believe in crafting the most natural-looking, most effective, and safest restorations imaginable for patients. 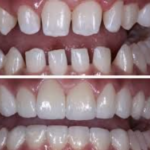 By utilizing only composite resin materials at our restorative dentistry facility in Decatur, we create more desirable restorations that look realistic and yield supremely satisfying outcomes. If your damaged smile has been treated with silver, mercury, or amalgam materials in hopes of protecting the structural integrity of your teeth, Dr. Gary Simms can carefully and gently remove those unsafe, unattractive materials and replace them with a tooth-colored solution to improve the appearance and health of your smile. Dental bonding is used to repair decayed teeth, alter the shape or size of a tooth, repair a structural imperfection, close small gaps in-between teeth, and protect a portion of the tooth’s root that has been exposed due to a receding gum line. Using a composite resin material, Dr. Gary Simms can restore aesthetic beauty to your smile while improving a specific dental problem. The bonding material is applied directly to the affected area, where it is molded into shape, hardened, and polished. This quick, simple procedure is highly effective at restoring minor cosmetic flaws. Do ill-fitting dentures keep you from feeling confident when smiling, eating, or talking? At Metro Decatur Dental Group PC, Dr. Gary Simms offers customized dentures to patients who are missing all of, or will soon be missing all of, their teeth. Our dentures snugly form to the contour of your smile for added comfort and reliable support. Every patient deserves to have a fully functioning, beautiful smile, which is why we design dentures that can also be supported by dental implants. The structural framework that implants provide to the prosthetic improves the aesthetic beauty, natural function, and convenience of traditional, ill-fitting dentures. Full-mouth reconstruction is a service that utilizes several restorative dentistry procedures to re-establish health and harmony within your smile. By addressing multiple imperfections, including decay and structural damage, we can significantly improve the health of your smile and craft your teeth into magnificent pieces of art that highlight your natural beauty. Trust the specialist who thousands of patients turn to for their dental needs. Dr. Gary Simms will not only help you rebuild your smile, he will restore your self-esteem. The cost of dentures will vary from patient to patient, so it’s impossible to predict the cost before evaluating the patient. The cost of dentures may also include associated expenses, such as x-rays, extractions or dental impressions. Your dentist will be able to give you a more detailed estimate of the expected costs at your initial evaluation. A partial denture is used to replace a number of missing teeth – as few as one – when some natural teeth remain in the patient’s smile. Partial dentures typically are attached to surrounding teeth by metal clasps and can be removed at the patient’s discretion. Patients may be instructed to remove a partial for certain periods of time in order to give the gum tissue a “rest” from the appliance. For example, the dentist may advise the patient to remove the partial during sleep. Permanent dentures are secured by dental implants, which are titanium cylinders that are biocompatible. This means that surrounding jawbone material can form a bond with the dental implants, which leaves them as permanent components of the jaw structure. Because the dental implants act like artificial tooth roots, they help to stabilize both the jaw and the denture. The jaw’s shape remains constant and the dental implants prevent bone loss, so the appliance will retain its fit. The patient does not need to worry about frequent re-linings or even periodic replacement of the appliance when the denture is supported by dental implants. Are dentures covered on insurance? Different dental insurance plans offer different levels of coverage, and your plan may provide some reimbursement for dentures along with associated treatment. Our expert billing staff will work with your insurer to maximize your insurance benefits. We accept a variety of payment options and can help you connect with a low-interest financing service for any expenses that are determined to be your responsibility.